Spyder Robotics Herpstat EZ2 Thermostat from ARS Caging, Professional Caging for Professional Breeders. Reptile Breeding Systems and Rodent Breeding Systems. 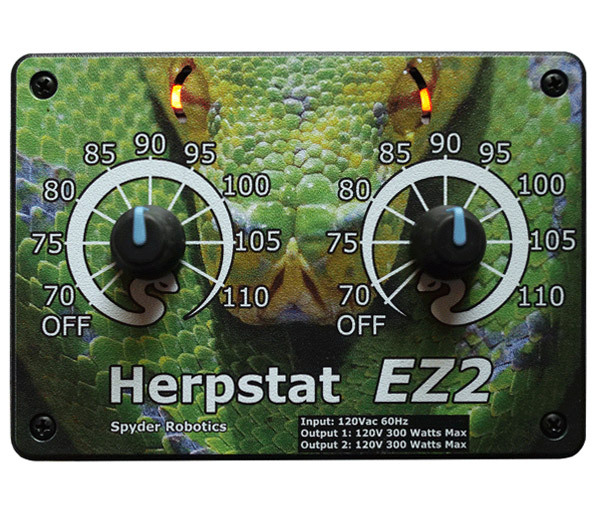 The Herpstat EZ2 is a dual output proportional thermostat. Easy to use dial controls and smooth temperature regulation perfect for the buget minded reptile owner. Flanged enclosure makes it easy to mount to the wall or enclosure. Glowing LED snake eyes give feedback on measured temperature and power status. Proportional heating constantly monitors and adjusts amount of heat necessary to maintain a target temperature (usable range from 70°F to 110°F). Dimming and Pulse heating modes. Basking Assist control built in to work with basking lights. Auto Power Matching constantly adjusts the power output curve to match the enclosures efficiency. Precision digital temperature sensors with an internal resolution of .1125°F. 30 minute low temperature alarm. 6ft power cord and 12ft temperature probe.